There are many ways to save the planet. Some avoid using plastics, while others segregate their waste for recycling. Many others also switch off their lights and other electrical appliances. But do you know there’s one habit that can make an even greater positive impact on our environment than all these other practices combined? If all 15 million Filipinos living in Metro Manila during the daytime went without meat for just one day, that would be equivalent to 150,412 trees planted and grown for 10 years. That would have prevented carbon dioxide emissions from 2,489,404 liters of gasoline or 177,941.57 LPG tanks, 1,150 passenger vehicles off the streets for a year, and produced 23.79 carbon emission reduction credits in a day in the Ambuklao Dam. Overall, this would have reduced 5,866,068.516 kg of carbon dioxide. And what’s more, with compassion being the main message during the Lenten Season in our predominantly Catholic nation, 15 million Filipinos would also have saved 1.8 million innocent animals from cruel slaughter. The cruel slaughter of millions upon millions of animals on a daily basis can be considered a modern genocide. Break our addiction to animal-sourced food, and we ultimately help save the planet. If we refrain from consuming pigs, cows, chickens, ducks, fish, crustaceans and other water creatures, and animal by-products such as dairy milk, egg and cheese, we would already have gone a long way in saving our environment. You can start breaking the habit of eating meat by looking for meat substitutes readily available, such as vegemeat made from tofu, mushrooms, jackfruit, and other meat substitutes like Quorn mycoprotein. 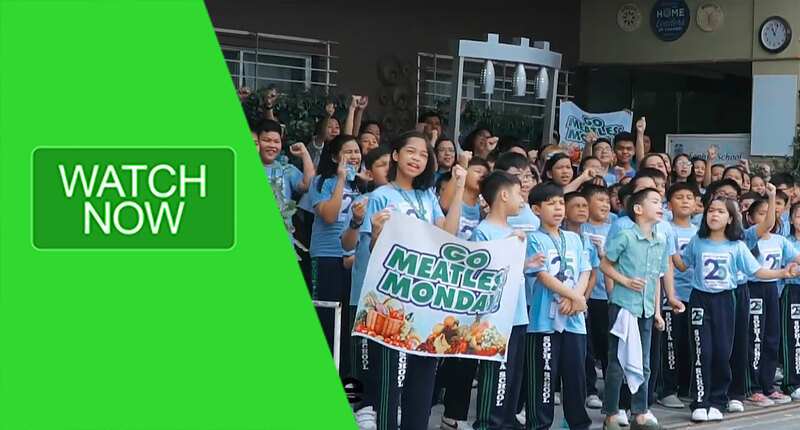 Sophia School in Meycauayan Bulacan has been advocating a Meatless Monday habit among its students for eight years now. Its school canteen has been serving predominantly vegetables and fruits—including Quorn as a meat alternative—not just on Mondays, but even throughout the entire schooldays. This has made the kids at Sophia School not only get to love eating their fruits and veggies, but they equip their bodies against lifestyle diseases such as obesity, heart and kidney diseases, and cancer. Sophia School believes that investing in the future not only involves inculcating young minds with sufficient knowledge, but also feeding young stomachs the right nutrients. The husband-and-wife team running the school, administrator Lorenzo Abacan and principal Marie Ann Regoso Abacan, first tried out the Meatless Monday offering in the canteen sometime in October 2011. Lorenzo, a psychologist, and Marie Ann, a nutritionist-dietitian, believe in a holistic health program that takes into consideration the student’s mental, spiritual, and socio-emotional development as well as the nutritional benefits of a plant-based diet. They implemented the plant-based diet program initially through this no-meat-Monday menu in the canteen. What was originally planned as just a once-a-week experiment eventually spread out to other schooldays, as well. Teacher Ann said that the children, faculty, and staff already looked forward to eating plant-based meals, even with the availability of meat dishes. And instead of selling soft drinks, the Sophia School canteen provides only fresh local fruits and juices, such as dalanghita, mango, watermelon, and soy milk. Experts have pinpointed that global livestock populations of cattle, buffalo, sheep, goats, camels, pigs and poultry and their processing are the primary contributors to greenhouse gas emissions. According to recent analysis, the lifecycle and supply chain of livestock products is actually responsible for at least 51% of all anthropogenic greenhouse gas emissions (GHGs). The food and climate connection may not be obvious to many, but just think of the amount of energy and fossil fuels it takes to raise and slaughter the approximately 65 billion land animals. That’s the number of animals in 2011 alone, the year Sophia School decided to implement its Meatless Monday campaign. As much as 45% of all earth’s land area is now being used for livestock and feed production instead of the trees needed to absorb excess greenhouse gases, and instead of growing food to feed the hungry people, while 20% of pastures are already degraded through overgrazing and erosion. Livestock farms now account for the use of 70% of the global freshwater and 38% of the world’s land-use conversion. Some 70% of the Amazon rainforest, in fact, has already been cleared for grazing and feed crop production. Livestock and their byproducts actually account for at least 32.6 billion tons of carbon dioxide per year. Raising livestock has also led to the creation of the so-called superbugs, antibiotic-resistant strains of bacteria that have reportedly killed 23,000 people a year. As more of us humans eat more animal products, we become actually poorer for it. Food experts have observed that the meat-eating habits of the wealthy around the world support a world food system that diverts food resources from the hungry. About one-third of the world’s total grain harvest is fed to cattle and other livestock, while as many as a billion people suffer from chronic hunger and malnutrition. Marine resources are now being exhausted, as well. Since the early 1990s, global fish catch has leveled out at about 90 million metric tons annually, and that hasn’t increased. The Earth needs room to breathe and regenerate from the use and abuse of over 7 billion humans. Going meatless for even just once a week is a great start to giving our planet a break, and its beautiful, lovable animals a much-needed reprieve. The ultimate goal, however, is to go 100% plant based 24/7, 365 days a year. Then, and only then, can our planet truly sustain life as we know it. Robert Goodland, former World Bank Group environmental adviser, and Jeff Anhang, environmental specialist, World Bank Group’s International Finance Corp.
Jeremy Rifkin, “Beyond Beef”; the United States Department of Agriculture and World Bank. Bruce Monger, oceanographer, Cornell, for the T. Colin Campbell Center for Nutrition Studies.